all have a critical role in achieving good outcomes. A few weeks after my son’s suicide, I serendipitously encountered a fellow writer at a conference. We met in the prayer room as she prayed with me in my grief. I left the conference with a gifted book, authored by this dear lady who had taken the time to share in my sorrow. She signed the title page, “Hemmed in Hope! Cynthia”. Little did I know how that book would speak to me in the weeks to come. 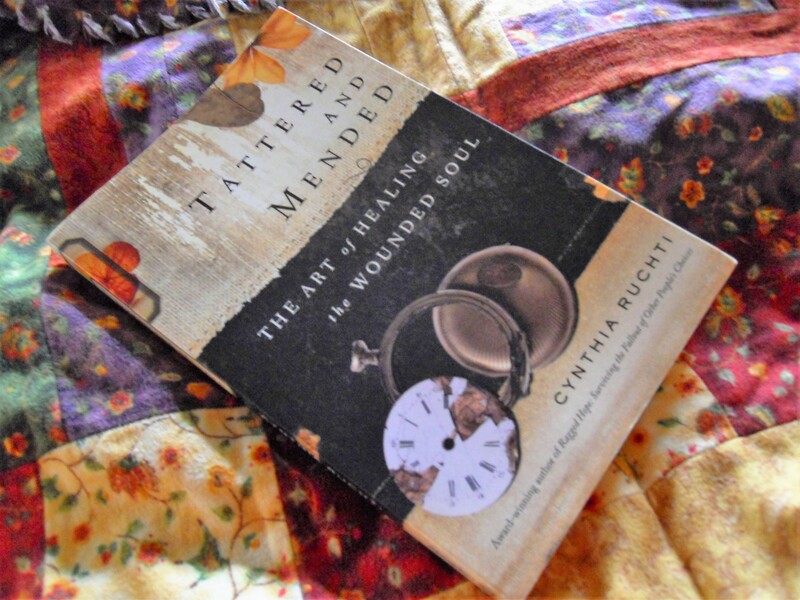 Cynthia Ruchti’s Tattered and Mended–the Art of Healing the Wounded Soul (Abingdon Press, 2015) helped me to reframe the pain and loss that has changed my life forever. She eloquently compares the process of healing souls tattered by tragedies, choices, and traumas to the art of reclaiming and restoring various treasures. As I read each chapter, I found myself drawn into the understanding that God can use even the worst that life on this earth brings to us, mending us into stronger and more centered souls. Cynthia describes the restoration of two-hundred year old Japanese garments through the techniques of sashiko and boro. As I read of the art of quilt restoration and discarded copper recycled into works of art, I began to believe that I could survive this loss and not be defeated. She writes of tapestries restored, fine arts reclaimed, stained glass recovered, antique dolls redeemed, and broken furniture refurbished. Throughout are two themes: that broken hearts are not to be viewed as unfixable and, thus, left to a miserable existence instead of joyful life in Christ, and that the tattered and mended soul can become a thing of greater beauty and worth than the original. I still struggle to know how my loss will ever result in something of beauty and worth. I know that since it has occurred, I am ever more sensitive to the multitudes of parents who have lost children and the many survivors of suicide in this world. And, I am thankful for gifted and inspired writers like Cynthia who invest time and talent and effort into offering a new perspective for those of us who feel we have suffered the most unimaginable pain and loss this life can offer. I pray that someday I can help bring similar healing and hope to others. Thank you, Debbie. The prayers of my sisters in Christ mean so much! I know you have been touched by your own losses and I do think you have been stronger through them.